A reader, Morgan Chemij emailed me an image of Google testing a new maps position in the Google search results. 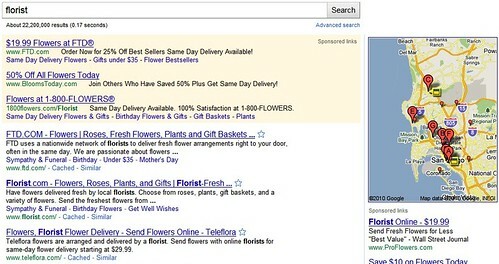 His image showed a map in the top right position, above the Google AdWords ads, for a search on [florist]. Personally, I do not see it, but Mike Blumenthal shows others are seeing it. As you can see, the map has one of those Google Maps Tags, which costs $25 per listing per month. Mike goes through the new location in more detail and I posted a thread in the Google Web Search Help forum about this. Personally, I kind of like it pushing down the paid results, as opposed to pushing down the organic results. But I am not sure advertisers will like it, unless they are in the map results.